I wish you had been with me in the garden on Monday afternoon. It was a lovely warm fall day and the ex-asters were dancing in the breeze, while honeybees flew from flower to flower in their mad dash to gather as much pollen as possible before the cold weather arrived. At this time of year the garden is a sea of blue asters that attract every pollinator you can imagine~Bumbles, Flower Flies, Green Metallic Bees, wasps, skippers and butterflies. But, this year the honeybees have outnumbered all the other visitors. I love the Bumbles and other native bees that live in my garden, but, seeing the honeybees in such large numbers made my heart soar with joy. Could it be that these bees belong to the young family with bee hives, chickens and a great big garden who live a few streets over? It's exciting to think that clay and limestone's flowers are contributing to their honey supplies. They might like that, I know I would. How wonderful, dear Gail. This is a perfect match, your young neighbors with the hive and your practically perfect pesticide free garden flowers. All good. Hi Gail! Very nice pictures. I am new to the world of habitat gardening and have never heard the term "ex-aster". What means? Thanks for sharing! I, too, love all my little bee friends and feel such a sense of happiness in my heart when I see them in my gardens. It will be a long winter without them to keep me company out there. What a great service you are doing, providing that wonderful buffet for all those pollinators, wherever they come from. Gail, you are the Queen Bee Photographer. Sometimes I wonder how they'd respond after being pursued as a photo-subject around the garden. Do you suppose they ever have those moments of doubt when with their heads deep within a blossom, they think..."I wonder if all that pollen makes my legs look fat?" Your bee photos are far superior to any I have attempted to get. You must be the bee whisperer. :-) Love seeing the activity on the blooms. Honeybees moved into our yard this year after a several year absence, and they're all over the pond drinking. I assume somebody must have put in a beehive nearby, and if I knew who it was, I'd come over and thank them--those little guys are part of the reason I had veggies! Beautiful photos Gail. 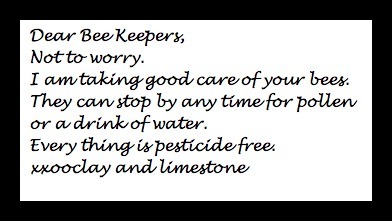 By all means go meet the wonderful Bee Keepers! So wonderful, Gail... the bees, the flowers, the colors, the beauty of autumn! Yes, by all means... you are part of a 'bee co-op' and those bee keepers would love to know their bees are safe in the neighborhood at C & L. So fun! Would you include me and my garden in your note posting? I would like to convey that message as well. They are very welcome to come any time. I could imagine they might be glad to see your garden. (Come and have lunch with your bees ;~) Always interesting to be invited into your neighbour's garden, if it appeals to the eye and heart because you can see another wildlife gardener lives there. I'm sure your neighbors would be thrilled to know they have such a bee-friendly neighbor nearby! I agree. Go meet the bee keeper. Love those Bumbles. I'm so glad you have the "proper" diet for the bees. They are not that plentiful I hear. How wonderful having bee keepers in the neighborhood Gail! I'd definitely drop them a card, and/or as others have suggested, go over and meet them. Your ex-asters are lovely and it's plain to see the pollinators think so too. Have a fantastic weekend! I bet your neighbors actually would love a card! I still have bees in my agastache, too. You should definitely attach that note to the honey bees to take back to their hives! I can't believe how quickly time passes these days! Writing...destination wedding...sick now....oh well...blogging seems to be last on my list these days, but I hope to be around more this fall. My garden looks horrible! I started digging it up and haven't been able to finish my projects. LOL about what Barbarapc said. It's 76 degrees here right now, and I had to come in to take a break from working outside. I need to take my water out with me. I'm seeing some checkerspots and skippers. I can't remember if there were any bees, but I did see a fly as well. We furthermore are fascinated Diablo several rare metal for all people today. you can play what you want, when you want, for free, or for real money. any quests available there - heck, maybe it's time to try a new continent. other experts of this sector don't notice this.